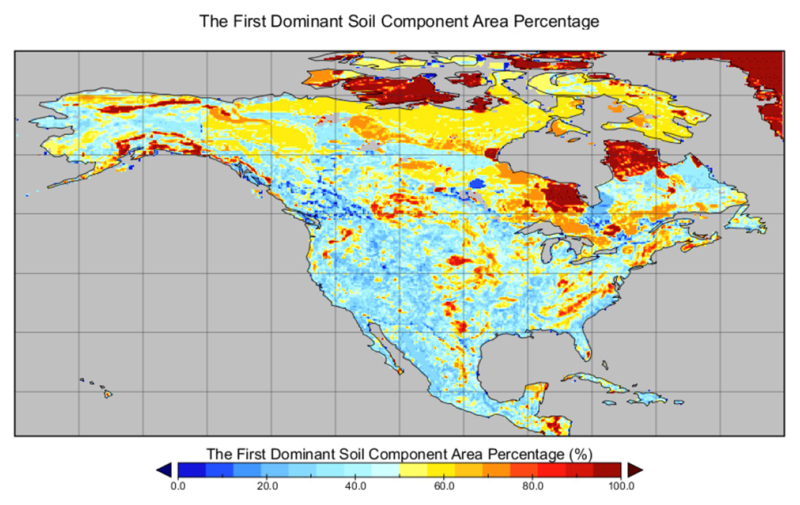 This data set provides soil maps for the United States (US) (including Alaska), Canada, Mexico, and a part of Guatemala. The map information content includes maximum soil depth and eight soil attributes including sand, silt, and clay content, gravel content, organic carbon content, pH, cation exchange capacity, and bulk density for the topsoil layer (0-30 cm) and the subsoil layer (30-100 cm). The spatial resolution is 0.25 degree. The Unified North American Soil Map (UNASM) combined information from the state-of-the-art US General Soil Map (STATSGO2) and Soil Landscape of Canada (SLCs) databases. The area not covered by these data sets was filled by using the Harmonized World Soil Database version 1.21 (HWSD1.21). The Northern Circumpolar Soil Carbon (NCSCD) database was used to provide more accurate and up-to-date soil organic carbon information for the high-latitude permafrost region and was combined with soil organic carbon content derived from the UNASM (Liu et al., 2013). The UNASM data were utilized in the North American Carbon Program (NACP) Multi-Scale Synthesis and Terrestrial Model Intercomparison Project (MsTMIP) as model input driver data (Huntzinger et al., 2013, Wei et al., 2013). The driver data (Wei et al., 2013, 2014) were used by 22 terrestrial biosphere models to run baseline and sensitivity simulations. The compilation of these data was facilitated by the NACP Modeling and Synthesis Thematic Data Center (MAST-DC). MAST-DC was a component of the NACP (www.nacarbon.org) designed to support NACP by providing data products and data management services needed for modeling and synthesis activities. There are 18 files provided in GeoTIFF (.tif) format with this data set: 16 maps of the eight soil attributes (one map per each attribute per soil layer), one map of maximum soil depth from the soil map sources, and one map of the percentage of the area of the first dominant soil component to the area of the cell. Liu_et_ al_2013.pdf: Provides additional attribute descriptions in Appendix A of the publication. NACP_MsTMIP_Unified_NA_Soil_Map.pdf: A .pdf of this document. This data set was collected as part of the NACP MsTMIP campaign. NACP (Denning et al., 2005; Wofsy and Harris, 2002) is a multidisciplinary research program to obtain scientific understanding of North America's carbon sources and sinks and of changes in carbon stocks needed to meet societal concerns and to provide tools for decision makers. Successful execution of the NACP has required an unprecedented level of coordination among observational, experimental, and modeling efforts regarding terrestrial, oceanic, atmospheric, and human components. The project has relied upon a rich and diverse array of existing observational networks, monitoring sites, and experimental field studies in North America and its adjacent oceans. It is supported by a number of different federal agencies through a variety of intramural and extramural funding mechanisms and award instruments. This data set provides topsoil layer (0-30 cm) and subsoil layer (30-100 cm) maps of the US (including Alaska), Canada, Mexico, and a part of Guatemala. The maps include eight soil attributes: sand, silt, and clay content, gravel content, organic carbon content, pH, cation exchange capacity, and bulk density for each soil depth. The Unified North American Soil Map (UNASM) combined information from the state-of-the-art US General Soil Map (STATSGO2) and Soil Landscape of Canada (SLCs) databases. The area not covered by these data sets was filled by using the Harmonized World Soil Database version 1.21 (HWSD1.21). The Northern Circumpolar Soil Carbon (NCSCD) database was used to provide more accurate soil organic carbon information for the high-latitude permafrost region and was combined with soil organic carbon content derived from the UNASM (Liu et al., 2013). Compilation from published soil databases between 1993/01/01 and 2010/12/31. This data set provides soil maps for the US (including Alaska), Canada, Mexico, and a part of Guatemala. 0.25-degree grid with a total of 142,080 North American grid cells. There are 18 files with soil attribute information in this data set in GeoTIFF (.tif) format. There is one file for each attribute for the topsoil and subsoil layers, one file depicting maximum soil depth from the soil map sources, and one map of the percentage of the area of the first dominant soil component to the area of the cell. Table 1. Soil Attributes of topsoil layer (0– 30 cm) and subsoil layer (30–100 cm). For complete descriptions of the attributes and their synthesis from various sources, please see the companion file, Liu et al., 2013, Appendix A. Maximum Soil Depth Unified_NA_Soil_Map_Maximum_Soil_Depth.tif Soil Depth cm Soil depth is the maximum soil depth of each cell before harmonization to standard layers. Maximum soil depth can be used as the approximate measure of the depth-to-bedrock. Topsoil Sand Fraction Unified_NA_Soil_Map_Topsoil_Sand_Fraction.tif sand % weight Sand content is defined as the percentage of this particle size class based on weight. Sand comprises particles or granules ranging in diameter from 0.05mm to 2.0 mm. Topsoil Silt Fraction Unified_NA_Soil_Map_Topsoil_Silt_Fraction.tif silt % weight Silt content is defined as the percentage of this particle size class based on weight. Silt size is between 0.002 and 0.0625 (In STATSGO2, the silt size is between 0.002 and 0.05 mm). Topsoil Clay Fraction Unified_NA_Soil_Map_Topsoil_Clay_Fraction.tif clay % weight Clay content is defined as the percentage of this particle size class based on weight. Clay is composed primarily of fine-grained with the diameter less than 0.002 mm. Topsoil Gravel Fraction Unified_NA_Soil_Map_Topsoil_Gravel_Content.tif gravel % volume Gravel content is the volume percentage gravel (diameter> 2 mm) in the soil. The depth-weighted average method was used to interpolate gravel content of different layers into two standard layers. Topsoil Organic Carbon Unified_NA_Soil_Map_Topsoil_Organic_Carbon.tif oc % weight Soil organic carbon concentration is defined as the percentage of soil weight. The mass-weighted average of soil organic carbon concentration was calculated when the unified soil dataset was harmonized into two standard layers. Topsoil pH (H2O) Unified_NA_Soil_Map_Topsoil_pH.tif ph pH is a measure for the acidity and alkalinity of the soil. pH was measured in a soil-water solution. The depth-weighted average method was used to interpolate pH values of different layers into two standard layers. Topsoil Bulk Density Unified_NA_Soil_Map_Topsoil_Reference_Bulk_Density.tif bd g cm−3 Bulk density is the ratio of the mass of soil material to the total volume of solids plus pores. Since bulk density is measured and estimated using different methods, potential bias among the bulk density measurements from different sources might exist. Topsoil Cation Exchange Capacity Unified_NA_Soil_Map_Topsoil_Cation_Exchange_Capacity.tif cec meq/100g Cation exchange capacity represents the total nutrient fixing capacity of a soil. Soils with low CEC have little resilience and cannot build up stores of nutrients. CEC values are represented as milliequivalents of hydrogen per 100 g of dry soil. The North American soil maps are useful to the modeling community for a data set of soil physical properties specifically created for North America by combining state-of-the-art soil information from STATSGO2, two versions of SLCs, and HWSD1.21. The soil data has been used in the data set: NACP MsTMIP: Global and North American Driver Data for Multi-Model Intercomparison project, archived at the ORNL DAAC. The maps were developed at 0.25 degree in latitude and longitude, which limits the flexibility for users to downscale to any spatial resolution (Liu et al., 2013). Uniform soil taxonomy was not provided because the data were derived from different sources that used different soil taxonomies. Quantifying the uncertainty of the UNASM was complicated, as it was developed from four data sources without uncertainty for any of them. This data set uses a simple index as the approximation of the certainty of the UNASM. It provides the percentage of the area of the dominant component selected for each cell to the total land area of the cell. This percentage can be served to quantify the extent to which the selected dominant soil component represents the cell. The higher percentage implies that the selected soil component can be more representative of the soil properties within the cell and the soil information assigned for the cell is of more confidence. 51.3% of all land cells have the 1st dominant soil component that occupies over 50% of the land area of the cell. The 1st dominant soil component selected for most of land cells can represent 40–70% of the cell area (Fig. 1). In terms of the source data quality, there is higher confidence in the area based on STATSGO2 and SLC3.2, and lower confidence in the area based on SLC2.2 and the area filled with HWSD1.21. Especially the high-latitudinal area filled with HWSD 1.21 was of less confidence due to the lack of observations when developing HWSD. The soil maps were developed from a combination of information from the state-of-the-art US General Soil Map (STATSGO2), and the Soil Landscape of Canada (SLCs) databases. The area not covered by these data sets was filled by using the Harmonized World Soil Database version 1.21 (HWSD1.21). The Northern Circumpolar Soil Carbon (NCSCD) database was used to provide more accurate soil organic carbon information for the high-latitude permafrost region (Liu et al., 2013). The required soil properties for STATSGO2 and SLCs were linked to the soil maps, which contained polygon features of soil and nonsoil map units on the landscape. The unique soil types and their combined area fractions were evaluated in a 0.25-degree cell. The soil type with the highest area fraction was selected as the dominant soil type in the cell, and the soil component was selected that had the largest area of the dominant soil type. The selected soil component’s vertical soil layers information along with their detailed soil properties were assigned to the target 0.25-degree grid cell. The data structure of HWSD 1.21 is similar to those of STATSGO2 and SLCs. The HWSD 1.21 is represented in a 30 arc-second resolution raster map instead of vector polygons. A similar approach was applied to that used for the two polygonal data sets to select the dominant soil type and soil component for each target 0.25-degree cell and then linked to the detailed soil attributes. The HWSD for North America has not been updated since the FAO Soil Map of the World was developed in 1970s. Thus, HWSD was given the lowest priority. STATSGO was first published in 1994, and in 2006 the STATSGO spatial and tabular data (which contains soil attribute values) were revised and updated, and was renamed to STATSGO2. SLC3.2, published in 2011, provides soil data for the significant agricultural regions of Canada. SLC3.2 is based on SLC3.0 (released in 2005), but SLC3.2 added some additional agricultural areas with new soil attribute data. SLC2.0, released in 1996, not only covers the agricultural region but also some other areas in Canada. However, SLC2.0 is less reliable than SLC3.2 based on the personal contact with the officers in Agriculture and Agri- Food Canada. Based on whether the data was reliable and up-to-date, different soil data sources were merged with the following priority: STATSGO2>SLC 3.2>SLC 2.2>HWSD 1.21. The top layer is from 0 to 30 cm and the sub layer is from 30 to 100 cm. The depth-weighted averaging method was used to interpolate the layers from the Step 2 data set to the two standard layers for the volume-related properties gravel fraction and pH, and the mass-weighted averaging method was used for the other soil properties that are related to soil weight. The standard map layers were compared to each layer in the Step 2 soil data set. If the map layer was entirely contained within a single unified soil data layer from Step 2, we used the Step 2 layer value for the standard layer. Otherwise, all layers from Step 2 that were fully or partially included within the standard map layers were identified, and a portion to each of the standard layers was used as the weighting to determine the standard layer properties. If the soil thickness was less than 30 cm or 100 cm, the maximum soil depth would be used for harmonization rather than extending the attributes to 100 cm. Therefore, if the soil thickness was less than 30 cm, the weighted average of soil properties in different layers would be assigned to the topsoil layer, but the subsoil layer (30–100 cm) would be filled with missing value, which is −999.0 in this study. The maximum soil depth derived from the data sources was kept as a separate variable. All fields were checked for the minimum and the maximum, which were then compared to the value range for each soil property in the source data sets. The cell values falling out of soil property value ranges were treated as errors. Missing values resulting from empty entries in the data source were filled with −999.0, except for soil texture fields in the surface organic layer. Zeros in sand, silt, clay content in the surface organic layer from STATSGO2 and SLCs are valid values for soil since soil texture is not applicable in this case. The sum of sand, silt and clay fractions in top and subsoil layers was corrected to 100% in the cases where necessary due to rounding errors. Similar to what was done in the development of the HWSD 1.21, when the sum was less than 100 %, the largest percentage was increased to obtain 100 %. When the sum exceeded 100 %, the highest value was reduced to obtain a sum of 100 %. The data sets above do not provide sufficient and accurate soil organic carbon information for the high-latitude permafrost region. The Northern Circumpolar Soil Carbon (NCSCD) database links organic carbon measurements from 1,647 pedons in the northern permafrost regions to several digitized regional/national soil maps to produce a combined circumpolar coverage (Hugelius et al., 2013). To provide a more accurate estimate of the soil organic carbon storage in North America, the NCSCD was combined with soil organic carbon content derived from the UNASM (Liu et al., 2013). FAO/IIASA/ISRIC/ISS-CAS/JRC: Harmonized World Soil Database (version 1.21), FAO, Rome, Italy and IIASA, Laxenburg, Austria, 2013. Huntzinger, D.N., C. Schwalm, A.M. Michalak, A.W. King, K. Schaefer, A. R. Jacobson, Y. Wei, S. Liu, R.B. Cook, and W.M. Post. 2013. The North American Carbon Program Multi-scale synthesis and Terrestrial Model Intercomparison Project -- Part I: Overview and experimental design. Geosci. Model Dev., 6, 3977-4008. DOI:10.5194/gmdd-6-3977-2013. Liu, S., Y. Wei, W. M. Post, R. B. Cook, K. Schaefer, and M. M. Thornton. 2013. The Unified North American Soil Map and its implication on the soil organic carbon stock in North America. Biogeosciences, 10, 2915–2930. DOI:10.5194/bg-10-2915-2013. Soil Landscapes of Canada Working Group: Soil Landscapes of Canada version 3.2. Agriculture and Agri-Food Canada, (digital map and database at 1:1 million scale), 2010.